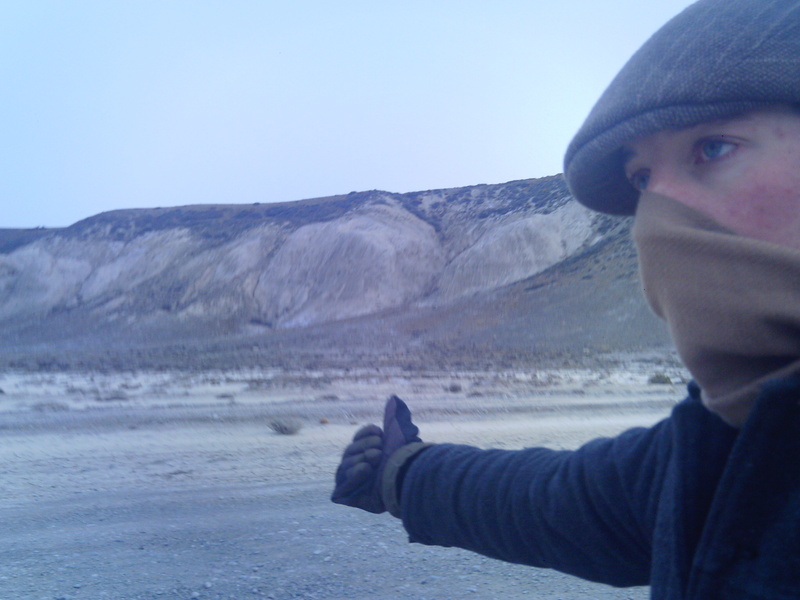 Your scarf can also be used as a bandana in windy, dusty or cold places. In the case of this spot in Patagonia, it was all three. Note: Sometimes, a scarf is essential in any type of weather, because it can double as a bandana in windy or dusty areas. 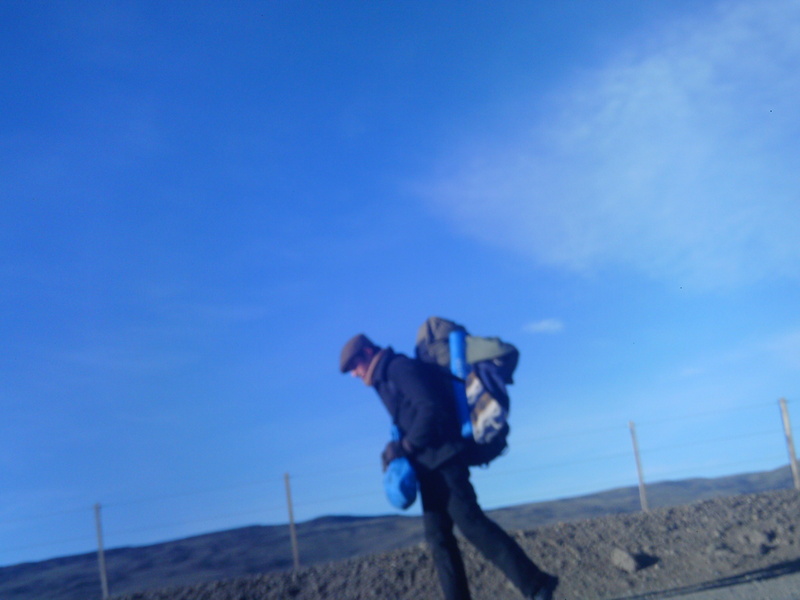 Also, a good pair of gloves is ESSENTIAL if the area you are hitchhiking in is cold. b) Shoes: A good pair of footwear is probably the most essential part of your gear. I personally reccomend a sturdy pair of boots; not cowboy boots, but lace-up military or hiking boots. These are waterproof, have good arch and ankle support, and will never let you down on a long walk. 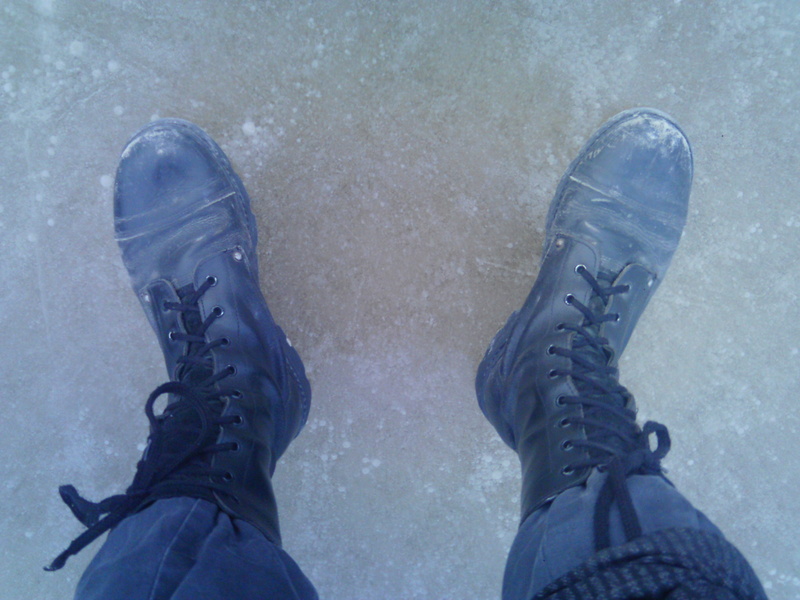 Additionally, in a hot climate, if you have lace-up military boots, you can tuck your pants into your boots to prevent disease-carrying mosquitoes and other biting insects from getting at your legs. In a cold climate with snow, your feet and pant legs will stay warm and dry. If you aren’t a boots kind of guy, than good walking tennis shoes will suffice, though you sacrifice the waterproof and lace-up advantages and they aren’t as warm. Never hit the road with a brand new pair of boots. This can lead to large, extremely painful blisters. Break them in first. c) Packs: Your backpack is your house; therefore, you must have a sturdy pack with plenty of room and pockets. You can choose a frame backpack or a supportless military backpack. Frame backpacks are generally more comfortable, though some people prefer the floppy military bag. The military bag is more spacious, though with less pockets and straps on the outside for excess equipment such as bedrolls and sleeping bags. Walking with a counterweight bag; in this case, it’s a cloth grocery bag. Some suggestions for packing your pack: Make sure you put the heaviest items on top. If you have too many things to fit in the main space and your pack is equipped with crossstraps, you might try using a counterweight bag. Counterweight bags can be anything, from plastic grocery bags to cloth bags, even tents. Clip this into your crossstraps; it can help counterbalance the weight of your pack. I usually keep food and other dispensible goods in my counterweight bag. d) Sleeping gear: The most essential part of your sleeping gear is your sleeping bag; subzero mummy-styles are the best. You should also have a bedroll or a blanket on which to lay your sleeping bag. In the tropics, a hammock with a mosquito netting is extremely useful and very valuable to your comfort. e) Shelter: Many people carry tents, and these are indeed useful. I carry a tent for cold or rainy climates, but a tarp and hammock in the tropics. Some of these aritcles may be difficult to find. Also include items based on your persopnal health, such as inhalers if you have asthma, bee sting kit of you’re allergic to bees, allergy tablets, and so on. h) A Good Mentality: While on your travels, it is important to always maintain a posotive outlook, to try and not get angry about small stuff, and remain patient. i) Your sense of Adventure: But of course this one should be a given. Take the path less traveled, make spontanious decisions, and the road will strech on forever into the farthest reaches of your imagination. thx very much for this site man very helpful. Lots of new, useful advice I havent seen before, some things I even wrote down, very well done blog i love it! If only i could make a profile on digihitch.com and chat with you and the others, I just started traveling so its to bad the site no longer is able to gain new members ever since Salmon passed. Anyways, I read many blogs these days, and I think very highly of your blog and its purity and freshness conveyed though your experiences, Real inspiration for me starting my own blog someday when I can call myself a perpetual traveler. I was curious if you had any affiliation with MatadorU? I am taking a travel writing corse with them and your website looks familiar. Never heard of him. IF you wanna chat good ole email still works. Didn’t know digihitch was not accepting new members. this whole story here gives me more and more the security to try it for myself. The more i read the more plastic gets my imagination about the thing. Keep it up! amazing posts, experience is the king!